Sky signs multi-year satellite bandwidth deal with Eutelsat. Amsterdam, London, Paris September 2016: Eutelsat Communications is reinforcing its collaboration with Sky Group with the signature of a direct, multi-year contract for satellite bandwidth that will serve newsgathering requirements for Sky’s UK, German and Italian operations. The contract covers the equivalent of three transponders on the EUTELSAT 16A satellite whose reach includes the core newsgathering footprint of Sky Group in Europe and the Middle East. 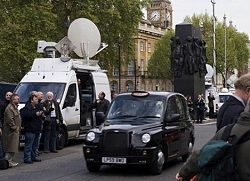 The capacity will be used by SNG vehicles that are the backbone of a mobile broadcasting infrastructure originating live news and sports reports for Sky channels in all three markets. With the EUTELSAT 16A satellite, Sky journalists are guaranteed access to reliable, high-power Ku-band capacity in an established footprint. Connectivity can be mutualised across the entire Sky SNG fleet, allowing for cost-efficient and global access to connectivity.